Julie Shields (aged 53), of Edinburgh Road, Bexhill, pleaded guilty to driving a Ford Fiesta on London Road, Bexhill, on June 6, while three times over the drink drive limit. She gave a breath alcohol reading of 105 microgrammes. The legal limit is 35 microgrammes. She was fined £270 and banned from driving for 22 months. Mark Anderson (aged 40), of Battle Road, St Leonards, pleaded guilty to assaulting a woman by beating her. The offence took place at Hastings on May 6. The court made a community order with a requirement of 100 hours of unpaid work. Philip Furnival (aged 56), of Scholars Walk, Bexhill, pleaded guilty to assaulting a woman by beating her. The offence took place at Bexhill on May 17. The court made a community order. Benjamin Reade, 18, of Wellington Place, Hastings, pleaded guilty to stealing a pedal cycle from Hastings railway station on December 2 last year. The court made a community order with a requirement of 40 hours unpaid work. Danny Robinson (aged 25), of Battle Road, St Leonards, was found guilty of using threatening behaviour. The offence took place at Hastings on April 17. He was fined £150 and ordered to pay £150 in prosecution costs. The verdict was proved in his absence. Suleyman Tadjoura (aged 21), of Tookey Close, Harrow, Brent, pleaded guilty to being in possession of a machete in a public place. 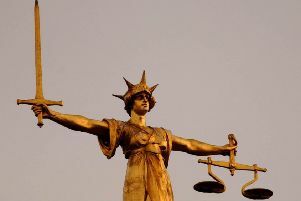 The offence took place at Havelock Road, Hastings, on April 1. He was committed to Lewes Crown Court for sentencing. Steven Apps (aged 47), of Malvern Way, Hastings, was found guilty of being in charge of a mastiff terrier cross dog, which was dangerously out of control at Station Road, Hastings, on February 2. He was given a 12 month conditional discharge and ordered to pay £300 in prosecution costs. Magistrates also made an order that the dog, Dougal, must be kept under proper control and muzzled and on a lead when outside. Michelle Tuohy (aged 24), of Peartree Road, Bexhill, pleaded guilty to assaulting a man by beating. The offence took place at Bexhill on January 18. The court made a community order. She was also fined £50 and ordered to pay £50 in compensation. Declan Begley (aged 36), of Rugby, Northamptonshire, pleaded guilty to driving a Fiat vehicle on Queensway, Hastings, on December 23 last year, while disqualified. He also pleaded guilty to driving without due car and attention, having no insurance and to driving while unfit to do so through drugs. He was sentenced to four weeks in prison. Paul Scotcher (aged 53), of The Twitten, Bexhill, pleaded guilty to riding an electric pedal cycle on Wallsend Road, Pevensey, while over the drink drive limit. He gave a blood alcohol reading of 124 milligrammes. The legal limit is 80 milligrammes. He was fined £160 and banned from driving for one year. Katherine Fowler (aged 34), of Church Road, Catsfield, pleaded guilty to driving a Renault Clio, on Church Road, on June 15, while over the drink drive limit. She gave a breath alcohol reading of 57 microgrammes. The legal limit is 35 microgrammes. She was fined £120 and banned from driving for 14 months. Bret Smith (aged 31), of Winchelsea Road, Hastings, pleaded guilty to driving a Citroen van on Priory Road, Hastings, on June 16, while over the drink drive limit. He gave a breath alcohol reading of 43 microgrammes. The legal limit is 35 microgrammes. He was fined £600 and banned from driving for one year.